Lynn Pierce (Christine Adams) is examining her daughter Anissa (Nafessa Williams) after her fight with Black Lightning. To Lynn’s surprise, she is healing fast. Lynn tries to talk her daughter out of being a vigilante and using her powers. Anissa: “This is a gift from God mom, a blessing.” Lynn: “You sound like your father.” Anissa: “That’s a bad thing?” Lynn tells her that it will lead to heartbreak. Anissa asks if her mother has any powers, since she doesn’t how can she know how Anissa feels. Jefferson Pierce/Black Lightning (Cress Williams) is listening to Peter Gambi (James Remar) make up a story about high tech thieves robbing labs. Jefferson doesn’t believe him and finds it hard to believe that Gambi could get information in a few hours about ‘high tech thieves’ and not know that a “6 foot albino” is still in town. Jefferson wants to know why Gambi is keeping things from him. Gambi: “I didn’t tell you to protect you.” Jefferson: “From Tobias.” Gambi: “From yourself.” Jefferson tells Gambi that he no longer trusts him. Tobias Whale (Marvin ‘Krondon’ Jones III) is in a steel cage with a street fighter Joey Toledo (Eric Mendenhall) brought for Tobias to spar with. Tobias quickly knocks him down, but to his surprise, the fighter gets back up. Tobias really gives this man a beating and kills him. He thinks the fighter must have been on something and they discover he has Green Light on him. Tobias meets with Tori (Edwina Findley Dickerson) and Syonide (Charlbi Dean Kriek) about the Green Light epidemic. Tobias: “I thought PCP was bad. This Green Light is on a whole ‘nother level. It’s too volatile, too addictive. Truthfully, it’s killing too many people and dead customers don’t pay.” He sends Syonide to tell Lady Eve he wants to speak to her about Green Light. Back at Garfield High, Jefferson and another teacher are talking to a student, trying to get him to keep his composure. Jefferson gets a call from Henderson, he asks Black Lightning if he knows about another Meta who stumped the ground and destroyed a confederate general statute on the college campus. Henderson isn’t upset about it since it was a confederate general, but you still can’t destroy property like that. Jefferson pretends like he doesn’t know. He tells Henderson about seeing Tobias, who hasn’t aged in 30 years. Anissa walks in. Anissa: “Dad, I’m ready to go out on the streets. I was thinking we could hit the community center and then maybe take down some Green Lighthouses and then…” Jefferson: “Whoa, Whoa, whoa, whoa, whoa. You are a teacher and a med student, and that’s all you need to be.” He tries to persuade Anissa not to use her powers. Jefferson: “Just because you have abilities, doesn’t mean you have to use them.” Anissa: “I’ve already used them.” Jefferson: “To destroy a confederate statue.” Anissa: “Oh, I know. It was a mistake. I lost my head.” Jefferson: “That’s just it, Anissa. You can’t afford to lose your head. That’s when people get hurt – or worse.” Anissa: “Okay, then train me. Show me how to do this.” Jefferson: “No, you’re clearly not ready.” Anissa tells him that he isn’t ready. He asks her about the box of research she gave Lynn. She tells him how about the research she started after discovering her powers and that she got her grandfather’s research on the missing kids with abilities from his editor David Poe. Jefferson chastises her for getting Lynn involved. They murdered his father because of it. He tells her to warn David Poe. Jennifer, Anissa and Jefferson are at home. Jennifer notices that something is up. Anissa and Jefferson pretend everything is alright and then lie that whatever tension is there because Jefferson missed a brain scan Lynn wanted him to take. Jennifer sort of buys it and leaves it alone. Anissa goes over to Gambi’s shop to talk to her mother. Lynn attempts to talk her daughter out of the vigilante life again, explaining all she will have to give up like her father did. Anissa: “Wait. Is dad being Black Lightning why you two broke up?” Lynn: “Yeah. This life is hard baby. That’s why I’m telling you. And if you’re not careful, you could lose yourself in it.” Lynn tells her that this life means that everyone else gets a happy ending but you. Anissa tells her mother she is willing to make the sacrifice. Lynn looks sad, thinking about the sacrifices Anissa will make. Anissa goes over to the newspaper office and finds out that David Poe was in a hit and run accident the previous day and is dead. There is a big cage fight and Joey Toledo is in the back counting the money from the fight. There is a commotion outside his office, Gambi is taking out Toledo’s men. Gambi enters and shoots Joey. He puts the box Lady Eve gave him and places it on Joey’s corpse. Tobias is at home enjoying some music. Tobias: “Jazz. One of the only things ‘brothas’ got right.” Tori walks in and tells her brother that Joey Toledo is dead and gives him the box that Gambi placed on his chest. It has white powder [albino] powder. Tori wants to take out Lady Eve. Tobias tells her that without the Shadow Board’s permission, they’ll have to bury him alongside Lady Eve. Tori has an idea to get around that. Black Lightning is on a rooftop across from Tobias’ jazz club. He has a flashback to his father’s murder. He is ready to return the favor. Black Lightning confronts Tobias and his entourage outside the club in a garage. Jefferson electrocutes Tobias and injures him. Tobias’ people shoot at Black Lightning, but their bullets bounce off of the electric shield Jefferson creates, one of the bullets hits Tori. Tobias’ bodyguards drag him into his car and leave Tori. Jefferson to a dying Tori: “Come on breath. Stay with me.” Tori gives him an evil look and dies. 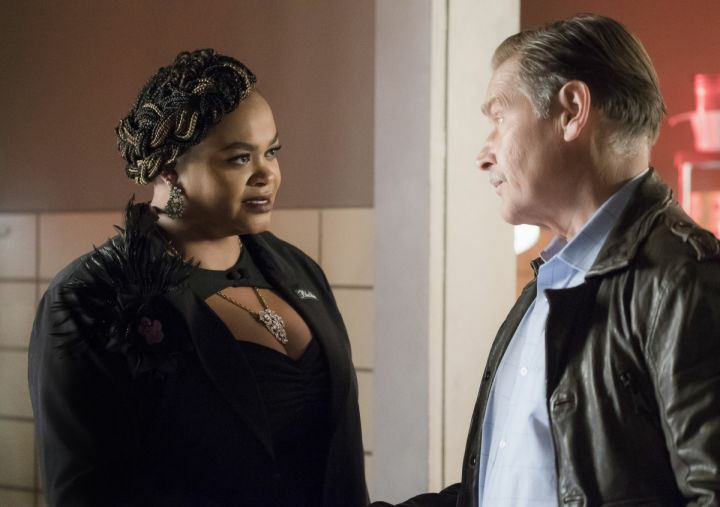 At the same time, Lady Eve is being attacked at her funeral home from guys Tobias sent to attack her with electricity guns [to mimic Black Lightning]. Just when you think that Lady Eve is safe, one of the assassins is hiding in a coffin and electrocutes her. Jefferson is on the porch drinking a beer. Anissa calls Grace for a date. Jefferson goes to Anissa’s room to talk to her. Jefferson: “I’m a hypocrite. You know how I always get on you to keep your head. I’ve let my emotions get the best of me over and over again. And tonight, a young lady died. I don’t know everything, but what I do know, I’m going to teach my daughter.” Anissa: “No, you’re not a hypocrite, you’re great. Dad, I can only hope to live up to your example.” Jefferson: “No, be better than me.” Jefferson gets a call from Henderson on the Black Lightning phone. Henderson: “You went too far this time.” On the news, the newscaster Joan Lincoln (Amanda Davis) is reporting on Lady Eve’s death. Because she was electrocuted, the police believe that Black Lightning killed her. Joan Lincoln: “And just like that, Freeland’s biggest protector became its biggest threat.” At a motel, Lala (William Catlett) who is quite alive, is sitting on a bed. In the bathroom is another ghost, Lawanda White (Tracey Bonner). She asks him, “Do you believe in the resurrection Latavius?” She turns into a mist and her face is tattooed on his chest. The ecosystem that Lady Eve and Gambi created was disrupted, and Lady Eve paid for the disruption with her life. Tori is dead, the cops think that Black Lightning is the killer. Jefferson no longer trusts Gambi, and from what I can see, for very good reasons. I don’t know what Gambi’s game is, and each week it seems to get murkier. So, it seems like he had a hand in creating the crime infrastructure in Freeland. It doesn’t appear he did it for profit, but for whatever reason he did it, he had to know this was destructive for this community. Helping Black Lightning defeat it doesn’t seem to be enough. Anissa is officially joining the family business. Lynn and Jefferson were against it, but Lynn soon realized Anissa was going to fight crime with or without their approval, so she asked Jefferson to train her. If she can’t keep her off the streets, she can make sure she will be safe as possible. Jefferson has been preaching one thing to Anissa but doing something entirely different. Once Tori died, he realized his own hypocrisy and agrees to teach his daughter. With the cops after him, and I’m sure Tobias on the warpath about his sister, he’ll need all the help he can get. Oh, and by the way Lala is alive, WTF. And to make it even better, it looks like the ghost of Lawanda White will haunt him. I bet you didn’t see that happening. We are at the half way point of this season. Last week, and especially this week’s episode has taken us to the season’s home stretch. I was surprised by who died this week, and who is back from the dead. I didn’t see any of it coming. The action was outstanding, especially the fight scene between Black Lightning and Tobias’ gang and Lady Eve at the funeral home. The whole scene was staged beautifully. I’m going to miss Jill Scott; her Lady Eve was great. She was such a complicated baddie. I really wanted to learn more about her and Gambi’s relationship. We lose one great character and get another back. William Catlett was outstanding at the beginning of the season and I feel like his character will be more interesting. It will be news if I say the music wasn’t that hot this episode. It was great as usual. It leaned more towards jazz this episode. Chelsea Bridge by Ron Surace played while Lady Eve was texting Gambi about the ‘cleaners’. Talk to Me by Run the Jewels was in the background while Gambi was putting down Joey Toledo. Can’t Play It Cool by Sheléa played when Anissa told Jefferson about David Poe and flowed into the scene with Lynn asking Jefferson to train Anissa. Tobias thinks that ‘brothas’ got jazz right, and he was listening to Think Deep by Coleman Hawkins when he enlightened us. The big fight scene when Black Lightning attacked Tobias and Lady Eve fought off Tobias’ assassins had All Runs Out by Alice Smith bind it together. When Jefferson is on the porch and Anissa is leaving a message for Grace, Keep on Trying by the Invincibles is playing. You and Me together, Pt. 1 by the Roy Roberts Experience plays when the news reports that Black Lightning killed Lady Eve and Lala and Lawanda White reappear.